Canadian Car Cost Reports – Free! Most will agree that Jaguar’s F-Type is one of the most beautiful sports cars to come along in decades, and this sentiment would be reason enough to make it one of the most popular cars in its class, which it is. Yet there’s a lot more to the F-Type’s success than jaw-dropping bodywork, from its lightweight aluminum construction that aids performance, supported by a wide variety of potent powertrain options, to its high quality luxuriously appointed interior, there are few cars that come close to matching the F-Type’s styling, capability or value. Yes, it might seem strange to be talking value with respect to a near-exotic sports car, but the F-Type, already an excellent buy throughout its initial four years of availability, became an even better deal since Jaguar installed its new in-house Ingenium 2.0-litre four-cylinder engine under its long, elegant hood for the 2018 model year. While the formidable turbocharged and direct-injected engine makes a very healthy 296 horsepower and 295 lb-ft of torque, it provides a considerable economical edge over its V6- and V8-powered counterparts and all rivals, while a significantly reduced base price of $68,500 didn’t hurt matters either. Last year’s starting point represented a $10k advantage over the F-Type’s previous base price, which resulted in a much more attainable point of entry and a whole new opportunity for Jaguar. In fact, the new F-Type P300 Coupe and Convertible instantly became prime 718 Cayman and Boxster competitors, whereas pricier more powerful F-Type trims, which include the 340 horsepower supercharged 3.0-litre V6 in base form, 380 horsepower supercharged 3.0-litre V6 with both base and R-Dynamic cars, 550 horsepower supercharged 5.0-litre V8 in R guise, and 575 horsepower version of the latter V8 in top-tier SVR trim for 2019, plus rear or all-wheel drive and six-speed manual or quick-shifting paddle-shift actuated eight-speed automatic transmissions, continue to fight it out with the Porsche 911 and others in the premium sports car segment, including plenty that cost hundreds of thousands more. The car in question in this review, however, is the 2019 F-Type P300, which starts at $69,500 in Coupe form and $72,500 as a Convertible this year. With close to 300 horsepower of lightweight turbocharged four-cylinder cradled between the front struts it should provide more than enough performance for plenty of sports car enthusiasts, especially when considering that key competitors like Audi, Mercedes-Benz, BMW, and Alfa Romeo don’t offer anywhere near as much output from their entry-level four-cylinder sports models, with 220 horsepower for the TT, 241 for the SLC, 241 for the (2018) Z4, and 237 for the 4C, while F-Type P300 numbers line up right alongside Porsche’s dynamic duo that are good for 300 horsepower and 280 lb-ft of torque apiece. If you’re wondering whether the F-Type P300’s performance will match your need for speed, it can zip from zero to 100km/h in just 5.7 seconds before attaining a top speed of 250 km/h (155 mph), and it feels even quicker with Dynamic sport mode engaged and its available active sport exhaust turned on. Jaguar makes its eight-speed Quickshift automatic standard in this rear-wheel driven model, and the steering wheel paddle assisted gearbox delivers super-fast shift intervals that combine with the brilliantly agile chassis to produce a wonderfully engaging seat-of-the-pants driving experience. The agile chassis just noted refers to a mostly aluminum suspension mounted to the bonded and riveted aluminum body structure noted at the beginning of this review, a lightweight and ultra-rigid construct that certainly isn’t the least expensive way to build a car, but results in satisfyingly capable handling no matter the corner the F-Type is being flung into. The stiffness of the monocoque allows Jaguar to dial out some of the suspension firmness that competitors are stuck with in order to manage similar cornering speeds, which allows this little two-seater to be as comfortable over uneven pavement as it’s enjoyable to drive fast. Specific to the P300, less mass over the front wheels from the mid-mounted four-cylinder aids steering ease and potential understeer, making this one of the best balanced sports cars I’ve driven in a very long time. My tester’s $2,550 optional Pirelli P-Zero ZR20s on glossy black split-spoke alloys certainly didn’t hurt matters, hooking up effortlessly after just that little bit of slip only a rear-wheel drivetrain can deliver when pushed hard through hairpins. What an absolute delight this car is. I love that it’s so quick when called up yet so effortlessly enjoyable to drive at all other times too. Even around town, where something more exotic can be downright tiresome, the F-Type is totally content to whisk driver and passenger away in quiet comfort. It helps that its interior is finished so nicely, with soft-touch high-grade synthetic or leather surfacing most everywhere that’s not covered in something even nicer, the cabin accented in elegant satin-finish aluminum and sporty red contrast stitching throughout. The Windsor leather covered driver’s seat is multi-adjustable and plenty supportive too, while the leather-wrapped multi-function sport steering wheel provided enough rake and reach to ideally fit my long-legged, short-torso five-foot-eight frame resulting in an ideal driving position that maximizes comfort and control. I’m sure larger, taller folk would fit in just fine as well, thanks to plenty of fore and aft travel plus ample headroom when the tri-layer Thinsulate filled fabric top is powered into place, a process that takes just 12 seconds at speeds of up to 50 km/h no matter whether raising or lowering. Doing the latter doesn’t infringe on trunk space, incidentally, which measures 200 litres (7.0 cubic feet) and is a bit awkward in layout. If you want more I’d recommend the F-Type Coupe that has one of the largest cargo compartments in the luxury sports car class at 308 litres (10.9 cu ft) with the cargo cover in place and 408 litres (14.4 cu ft) with it removed. Back in the driver’s seat, Jaguar provides a classic dual-dial analogue gauge cluster centered by a sizeable colour TFT multi-information display, which while not as advanced as some fully digital driver displays on the market is probably more appropriate for a sports car that focuses on performance. The big change for 2019 was the addition of a 10-inch Touch Pro infotainment display, which replaces the 8.0-inch centre touchscreen used previously. Its larger size makes for a more modern look, while it’s certainly easier to make out obstacles on the reverse camera. The larger screen benefits all functions, with the navigation system’s map more appealing and easier to pinch and swipe, and only the home menu’s quadrant of quick-access feature not making use of all the available space (a larger photo of the classic red British phone booth would be nice). The standard audio system is from Meridian and makes 380 watts for very good sound quality, while additional standard features include pushbutton ignition, an electromechanical parking brake, automatic climate control, powered seats, and leather upholstery on the inside, plus 18-inch alloys, LED headlights with LED signature lighting, rear parking sensors, a powered retractable rear spoiler, and more on the outside. The Windsor leather and contrast stitching noted earlier came as part of a $2,250 interior upgrade package that improves the upholstery overtop special performance seats while finishing the top of the instrument panel, console and door trim in the same Windsor leather for a thoroughly luxurious experience, while my tester’s heated steering wheel and heated seat cushions come as part of a $1,530 Climate pack, with an extra $300 adding ventilated seats to the mix if you prefer, while Apple CarPlay and Android Auto smartphone integration was added for an additional $300. Lastly, proximity-sensing keyless access made entering and exiting more convenient for $620, heatable auto-dimming side mirrors with memory made nighttime travel easier on the eyes for just $210, as did automatic high beams for oncoming traffic at $260, whereas blind spot assist might have definitely proved worthwhile at $500, as would front parking sensors at $290, while the aforementioned switchable active exhaust system was well worth the investment for another $260. Incidentally, all prices were sourced right here at CarCostCanada, where you’ll find pricing on trims, packages and individual options down to the minutest detail, plus otherwise hard to find manufacturer rebate information as well as dealer invoice pricing that could save you thousands when negotiating your deal. At the risk of this sports car review becoming terminally practical, the F-Type P300’s fuel economy is so good it deserves mention too, with both Coupe and as-tested Convertible achieving a claimed 10.2 L/100km in the city, 7.8 on the highway and 9.2 combined, which beats all Porsche 718 and 911 variants by a long shot, not to mention hybrid sports cars like Acura’s new NSX. Of course, F-Type efficiency takes a back seat when moving up through the aforementioned trims, but the more potent V6 is still pretty reasonable at 11.9 L/100km city, 8.5 highway and 10.4 combined, at least when it’s mated to the automatic. This engine allows for a six-speed manual too, which isn’t quite as praiseworthy at 14.9, 9.8 and 12.6 respectively. Enough silliness, because we all know buyers in this class don’t care one iota about fuel economy despite all the effort that Jaguar puts into such regulatory concerns. The F-Type is really about titillating the five senses via near overwhelming visual stimulation when parked and endorphin releasing on-road acrobatics when active. Of course, 296 horsepower can’t excite to the same levels as 550 or 575, but this F-Type P300 is the perfect way to make each day more enjoyable without breaking the bank. It’s an affordable exotic that’s as worthy of the “Growler” emblem on its grille and wheel caps as the “Leaper” atop its rear deck lid. Up to this point Porsche has offered its 718 Cayman coupe and 718 Boxster roadster in base, S and GTS trims, but soon its most affordable line of sports cars will arrive with a new “T” designation, which promises performance purists less of what they don’t want and more of what they do. Specifically, 718 Cayman T and 718 Boxster T buyers will get more performance features in a car that costs and weighs less. 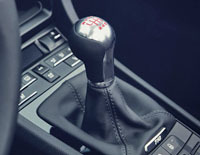 Starting with the base model’s 2.0-litre turbocharged four-cylinder boxer engine, good for 300 horsepower and 280 lb-ft of torque, T models add a short-throw shifter, a mechanically locking differential and Porsche Torque Vectoring (PTV) in base six-speed manual guise, or the Sport Chrono Package as standard equipment for seven-speed dual-clutch automated PDK cars, the latter resulting in 0.2 seconds of extra jump off the line from a car that’s already 0.2 seconds quicker than the manual. Also notable, the Sport Chrono Package includes Launch Control and a “push-to-pass” style Sport Response button in the centre of the steering wheel-mounted driving mode switch, making it the transmission of choice when ultimate performance is paramount. To clarify more fully, straight-line performance with the manual remains the same as the regular 718 Boxster and 718 Cayman at 5.1 seconds from standstill, while PDK-enhanced cars increase their zero to 100km/h sprint times from 4.9 to 4.7 seconds, identical to the base 718 models. Likewise, both base cars’ top speeds continue into T trim unchanged at 275 km/h. Additional standard go-fast goodies in T trim include Porsche Active Drivetrain Mounts (PADM) that incorporate dynamic hard and soft gearbox mounts for reducing vibration and even improving performance, claims Porsche, plus a sport exhaust system, unique high-gloss titanium grey-painted 20-inch five-spoke alloy wheels, and a first for the base turbo-four, the Porsche Active Suspension Management (PASM) electronic damping system that, depending on the Normal, Sport, Sport Plus or Individual driving mode selected, instantly adjusts for road surface conditions and driving style changes, all riding on a 20-millimetre lower ride height. Making a visual statement is a grey side striping package featuring scripted “718 Cayman T” or “718 Boxster T” nomenclatures, and Agate grey mirror caps to match the aforementioned wheels, plus black chrome tailpipes. Inside, the 718 Boxster T and 718 Cayman T are upgraded with a GT sport steering wheel, scripted “Cayman T” or “Boxster T” logos highlighting the black instrument dials, gloss black instrument panel inlays and centre console trim, special red paint for the gear shift pattern atop the shift knob, two-way powered seats, seat upholstery featuring black Sport-Tex centre sections, embroidered “718” logos on the headrests, plus the most identifiable addition of all, black mesh fabric door pulls in place of the usual door handles, which can be changed for optional coloured pulls as seen in associated photos. When checking the gallery you may also notice something missing from both cars’ instrument panels, their Porsche Communication Management (PCM) touchscreens that have been removed to reduce weight, and replaced by a big, gaping hole Porsche calls a “large storage compartment.” We won’t see this omission in Canada due to a new regulation that made backup cameras mandatory as of May 2018. For this reason we shouldn’t hold out any hope for Canadian-spec 718 T models to be offered at five- to 10-percent discounts when compared to the current base Cayman and Boxster when outfitted with identical features, as promised in European markets, but we should get to choose from the same standard and optional colour palette that will include black, Indian Red, Racing Yellow, and white at no extra charge, plus optional Carrara White, Deep Black and GT Silver metallic hues, as well as somewhat pricier Lava Orange and Miami Blue special colours. If you like what you see, make sure to contact your local Porsche dealer to reserve your very own 718 Cayman T or 718 Boxster T, because special models like these are in the habit of selling out quickly. We are Canada's #1 choice for New Car Buyers and the Nation's Most Trusted Online New Car Pricing Service. Since 1999 we have provided Canadian New Car Buyers with access to our proprietary Dealer Invoice Price Reports. Complementing the Dealer Invoice Price Reports, we also have an in-house team of automotive professionals with over an accumulated 100 years of experience and a Canada-Wide New Car Dealer Network.